In anticipation of Spring, we wanted to bring our plant life indoors. 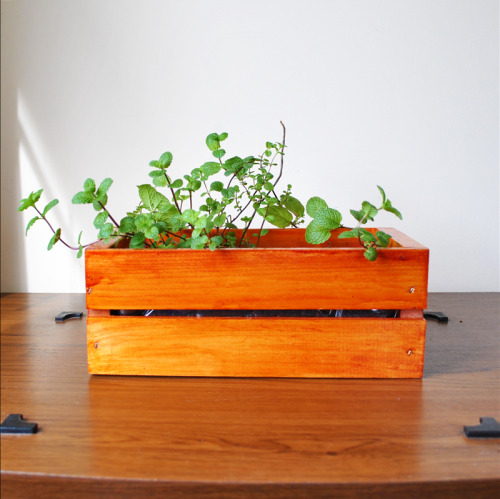 Over the course of one weekend, we put together a wood planter box perfect for a sunny windowsill. All of our materials were either ones we had collecting dust at home or purchased from our local crafts store. Of course, no craft project is complete without a photo series to document it. 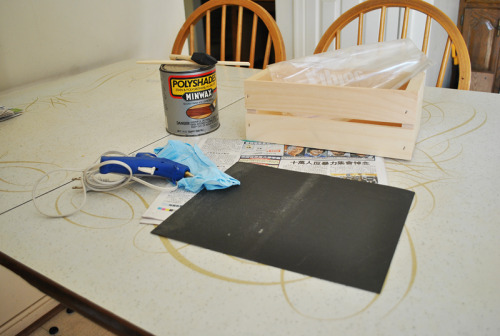 With our step-by-step photo guide, this DIY weekend project really is foolproof! 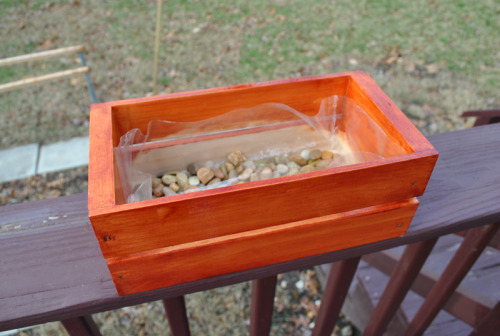 Created a windowsill planter box of your own? Be sure to let us know on our Facebook or Twitter! We love seeing the amazing creations our readers come up with. 1. 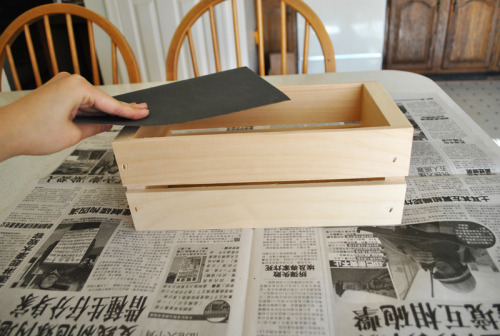 With newspaper under your planter box, use sandpaper to smooth the edges of the box. 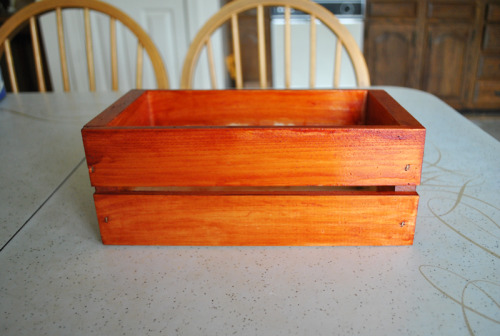 Once smoothed, discard the wood particles and carefully dust off your box. 2. Wearing gloves, pry off the lid of the can of wood stain with a screwdriver. Stir your stain thoroughly until the color becomes uniform, making sure to get your stirrer to the bottom. We didn’t have a paint stirrer so we improved with a pair of wood chopsticks. 3. 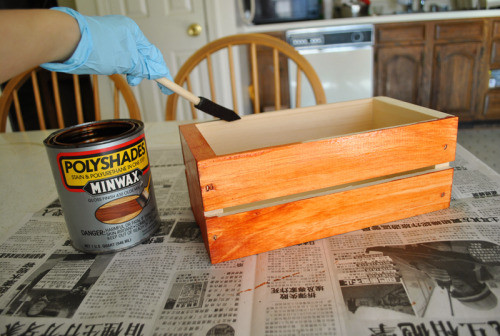 Using your brush of choice, thinly layer a coat of wood stain on your box. Work in one direction, keeping the paint edge wet. 4. Allow stain to completely dry before adding on another layer. We used a sponge brush throughout the entire process but would use a bristle brush next time to avoid tiny sponge pieces sticking to our box. 5. 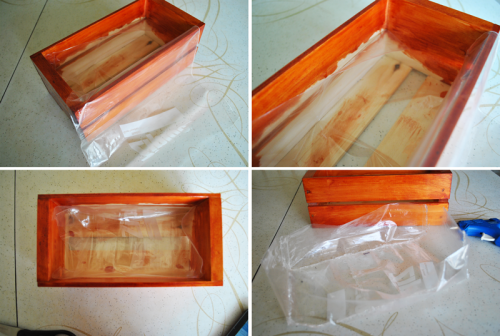 After you’re satisfied with the color of your box, line with a heavy duty plastic bag. Because our box had slits, we wanted to use a transparent bag so we could see inside. We created a box shape with a single gallon-sized freezer bag and hot glue gun, eyeballing measurements. If you’re doing the same, make sure to allow your glue gun to slightly cool before applying on the plastic. If not, it may melt the plastic! 6. Fill your box with about a 1-inch layer of small rocks. Because our planter box won’t have drainage holes, we don’t want our plant roots to rot from sitting in water. 7. Fill the remaining space with potting soil, up until about ½-inch from the liner edge. 8. 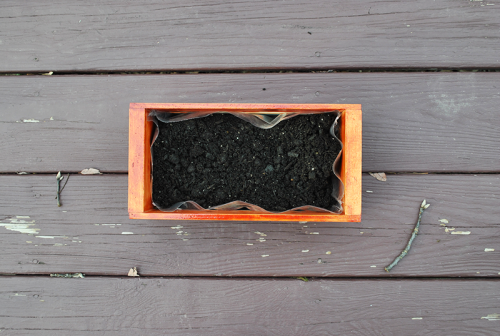 Transplant your plants or sow your seeds, and then cover your soil. 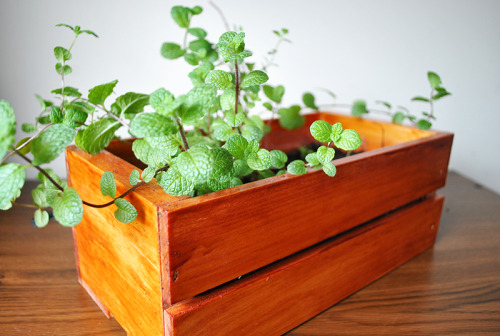 Move planter box to a sunny window and watch your plants grow!